From a Price action perspective, in the Daily chart of IDFC Bank we can notice a change in Price behavior and Perception of Market participants. From Aug 2017 until the end of Dec 2017, Share prices were completely struck within the range of 62.00 – 53.00 per share. But from the beginning of this year, Stock prices rallied extensively from 54.00 – 68.00 (almost 25% increase in stock Prices), in a matter of days. Market broke the long-standing resistance zone at 62.00 with good force and momentum. These moves were driven by news announcement of merger between IDFC Bank and Capital First. The classical market behavior of “Buy the rumor, sell the news” took place in the stock. Just by looking at the size of candlesticks we can understand that institutions and Insiders have bid the prices higher. Large bullish candles technically indicate buying pressure created by inflow of big market orders. The price action formation also looks similar to Event spike pattern. Looks like arbitrage traders who have already priced in the merger event is now liquidating their previous positions which is technically pushing the prices lower. Apart from that, remaining factors are pointing out Market structure and sentiment might change in IDFC Share prices. When we think about this for a moment it all makes sense – Couple of months back, this stock was trading with less volume and lower market participation rate, now big market orders are flowing in and driving the share prices! Even fundamentally IDFC Bank has taken a lot of big steps such as restructuring non performing assets, changing the management status and merger with capital first etc. These facts tell us why the Investors perceptions are changing. 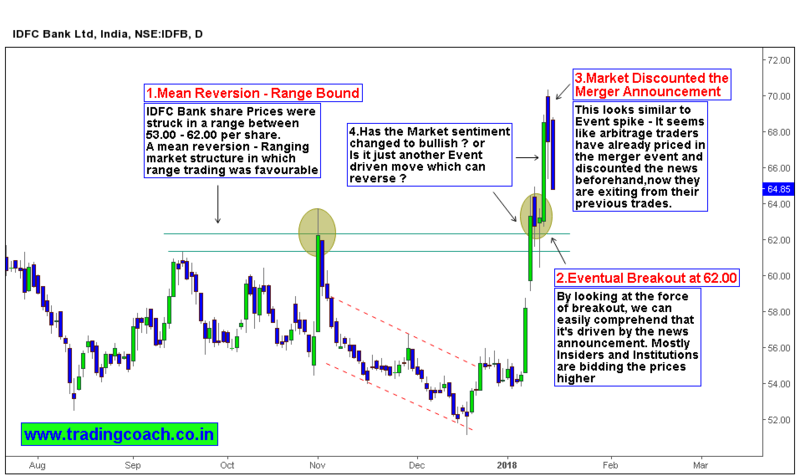 Swing traders, Positional traders and even Investors must keep an eye on developing price action in IDFC Bank daily chart to get further insight. Reliance Price action – Range continuation or Breakout ?